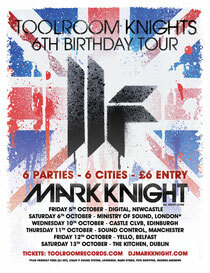 Toolroom Knights returns to the UK to kick off their sixth birthday tour on Friday 5th October. In October 2011, the brand unleashed a huge party at the Brixton Academy, which saw Toolroom fans from across the country descend upon the landmark venue for a sell-out all-nighter. To show their thanks and loyalty for their continued support, Toolroom are bringing their club night direct to the fans and giving something back, with all events starting off at just £6 advance entry and featuring Mark Knight playing all night long. The tour takes place across two weeks in October, kicking off on Friday 5th at Newcastle’s Digital. Next up, they venture south to Toolroom’s spiritual home, Ministry of Sound in London, the flagship venue for the birth date of the brand on Saturday the 6th. Mark Knight & Friendly Fires (DJ Set) headline the infamous Box with support coming from Crazy P Soundsystem, Lovebirds and the Toolroom resident DJs Pete Griffiths, Mark Storie and George Andrews in 103. Then it’s back on the road to the newly opened Castle Clvb in Edinburgh on Wednesday 10th before hitting Sound Control Manchester on Thursday 11th. The brand then returns to its Irish residency, Yello @ Mynt, Belfast on Friday 12th, rounding off the tour at The Kitchen, Dublin on Saturday 13th October. The £6 tickets are limited to 600 per venue and should sell out quickly.